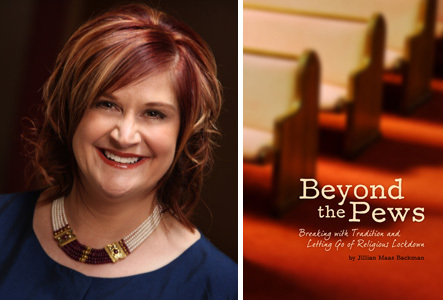 On Wednesday, November 9, the author of BEYOND THE PEWS: Breaking With Tradition and Letting Go of Religious Lockdown, Jillian Maas Backman, will be giving an interactive presentation, Chairside Chat With Jillian, at Boswell Books, 2559 N. Downer Ave., Milwaukee, WI at 7pm. The event is free and open to the public. Books will be on hand for purchase. In her interactive autobiography, Jillian shares the personal account of her journey from spiritual innocence into a religious wilderness where she often hid behind her father’s powerful preacher’s robe. For many years she hoped her intuitive gifts would simply go away, but they never did. “I remained reclusive within the untainted spirit world until I became comfortable with my spiritual individuality and emerged from the sacred shadows into the awakened light of day.” Jillian eventually learned to embrace the duality of her traditional religious upbringing and her connection with uncensored, untainted spirit. Jillian Maas Backman offers valuable ways for you to connect with your spiritual intuition. Interactive sections offer soul lessons to help you understand your own faith experiences and natural intuitive talents. Explore ways to Chart your Divine Energy Rhythm, find the difference in Art of Doing versus the Art of Being, and learn how to analyze colors seen. This extraordinary book guides you to a deeper awareness of God s constant loving presence in our lives, to a rebirth from a religious dogmatic cocoon into an active awakened etheric butterfly. Next PostThe Susan Murphy Milano Show, “Time’s Up!” Susie Kroll on Teen Dating Violence and Bullying, What Can We Do?